Prince William and Duchess Kate smiled with their children, as Prince Harry and Duchess Meghan held each other during their wedding party. You've got royal holiday mail – sort of. As holiday cards begin to roll in, might we present the crown jewels of your mantels: the British royal family Christmas cards, or at least the photos featured on the cards which were shared to Twitter early Friday morning. Newlyweds Prince Harry and Duchess Meghan selected a photograph from the reception following their May 19 nuptials for their card. 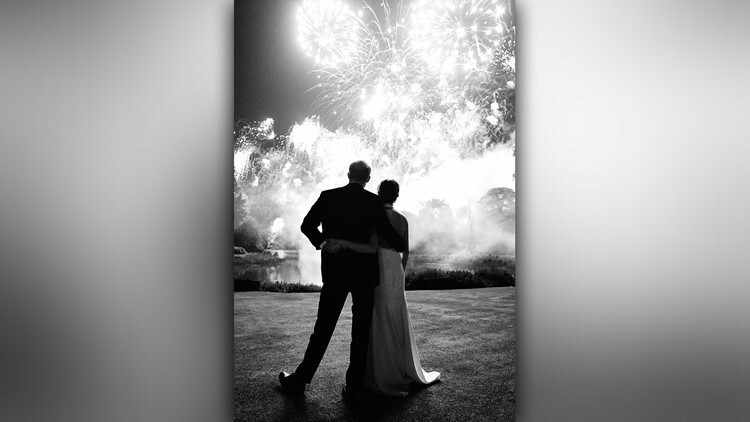 Taken at Frogmore House by Chris Allerton, according to Kensington Palace's Twitter, the newlyweds are shown from the back, holding hands and embracing while fireworks burst overhead. This photograph taken by Chris Allerton and supplied by Kensington Palace, shows the Prince Harry and Meghan watching fireworks during their Wedding Reception at Frogmore House on May 19, 2018 in Windsor, United Kingdom. Prince Louis, born in April, makes his Christmas card debut in the Cambridges' casual family photo. The smiling baby sporting a sweater, shorts and what appear to be tights as he poses in Duchess Kate's arm. Princess Charlotte, 3, hangs on to Kate while her brother, Prince George, 5, who has graduated to wearing long pants, grips dad Prince William's shoulders with both hands while balancing on one leg. Matt Porteous snapped the family photo at Anmer Hall, Kensington Palace tweeted. The portrait of Prince Charles and Duchess Camilla appears to have come from his 70th birthday portrait shoot. It features a photo of the two sharing a loving gaze on a bench surrounded by greenery, snapped by Hugo Burnand at Clarence House over the summer, according to the official Twitter account for the royal residence. He is clad in what appears to be a navy, pinstriped suit, while his wife wears an ivory dress with 3/4-sleeves. "Wishing you a very Happy Christmas and New Year," the inside text reads.